Welcome to Tuesday Treasures where you can link your favourite piece of art, whether it be a card, altered item, in fact just anything that is special for you this week. I had a great day with Lucy of True Colours, a couple of weeks ago. For those of you who know Lucy, she makes these amazing altered bags and she kindly not only showed me her ones (and they are fabulous IRL), but she gave me one to alter. So having completed most of it on the day, I brought it home and just finished off the stamping and added the trim. So this is my Treasure for the week. I won't tell you how it is made as Lucy is going to write an on-line class for it, so keep an eye on her blog for when she is ready to begin. What is your 'Treasure' this week? Why don't you link it below for fun so that others can come and visit you. I certainly will. 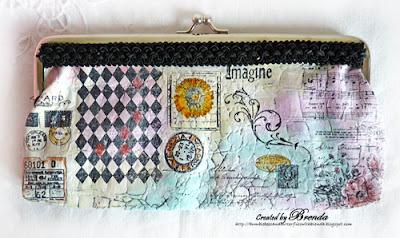 Just gorgeous Brenda, love all your stamping, certainly is something to treasure. This is a treasure. You have created a beautiful piece of altered art and what is even better, something that you can actually use. Thanks for visiting me even when I have been unable to come and visit you. Brenda, you've created another wonderful treasure. 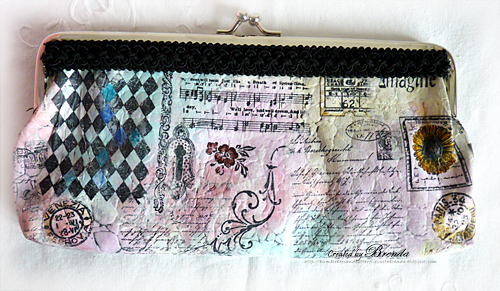 This is a beautiful altered bag. What a gorgeous bag! I imagine you had a wonderful time playing with Lucy. Wish we didn't live so far apart... I'd love to have a crafty day with you two! Fabulous! Love how this came out! ooooh this is amazing, something I so want to try, thank you for the inspiration. Brilliant Brenda, I am just finishing my treasure off today and hopefully will post later. This is fabulous. Just my cup of tea. I want! OMG your bag is gorgeous Brenda! hi Brenda , this is amazing such beautiful work totally unique and gorgeous.